New York is the wealthiest city in the world and the world’s most popular city for wealthy people. It has the “largest annual average private investment in property” of any city, according to the London-based reality firm, Knight Frank. But this “investment” isn’t making New York a nice place to live for everyone. In fact, the impact of this “investment” is being felt across our city. Buildings are leveraged and flipped to reap massive payoffs, but they come with a serious inconvenience to the investors — the people who live there. Of all the brutal aspects of capitalism, a family being forcibly removed from their home with nowhere to go is among the most horrifying. Families who are removed from rent-stabilized apartments are unable to find anything they can afford in their old neighborhoods. They are forced to leave the city or move much further away from their family, friends, schools and jobs. Rent control is one of most effective ways to protect working-class tenants from being priced out of their homes and neighborhoods. Because it stands in the way of investors making money, however, it is under attack. New York’s rent laws are a labyrinth designed so that tenants can’t win. In 1997, landlords successfully won critical weakening measures that have led to the loss of hundreds of thousands of rent-regulated apartments in New York State. Currently, landlords are awarded huge rent increases upon vacancy and the ability to remove an apartment from rent regulation entirely if the rent can be raised above $2,733.75. These loopholes, among others, create an incentive to displace, pressure, and harass tenants, driving them from their homes. They are part of the reason why homelessness has skyrocketed to 62,000 people in New York City from 25,000 in 1997. The horror stories range from an 85-year old woman in Flatbush dragged to court repeatedly and locked out of her apartment by her landlord on frivolous charges only to die right after a judge ruled in her favor to dozens of Chinese immigrant tenants thrown into the streets on a freezing winter night when their landlord had the building declared unsafe in retaliation after they began to receive rent-regulated protections. These are just the stories that have made the news. In most rent-stabilized buildings across the city, tenants are facing some kind of questionably legal monetary pressure to increase their rents, with the aim of driving them out altogether. My building is a good example. I live on the Lower East Side, in one of the few rent-stabilized apartments left in my building and in my neighborhood. My landlord has pulled out all the stops to get us out — exploiting every loophole in the state’s rent laws. Since 2011, under Governor Andrew Cuomo, rent in my apartment has gone up over $400 due to a Major Capital Increase (MCI) coupled with yearly increases from the Rent Guidelines Board. MCIs are a tactic used by landlords to dramatically raise the rent on stabilized tenants after doing basic repairs or upgrades. In our case, it was pointing and resurfacing the exterior walls. The process of challenging these rent hikes is psychologically draining. We received a notice from the housing agency (DHCR) that our landlord had applied for this huge rent increase and then spent months frantically trying to get information from DHCR on how to challenge it. Other tenants and I ended up hiring an attorney and an architect to inspect the work, which none of us could really afford. We spent years paying off those bills. The architect stated that the work was incomplete and shoddy but after two years of trying to figure out how to challenge the increases and spending money we don’t have, Gov. Cuomo’s appointees at DHCR completely ignored us and the increase was approved. These laws are a labyrinth designed so that tenants can’t win. There are only four rent-regulated tenants left in my building that this increase will affect. This makes solidarity with market-rate tenants very difficult, undoubtedly an effect of deregulation that the real estate industry capitalizes on and exploits. By the end of this episode, we were all exhausted and our homes had become less affordable. If nothing changes, we will face another $200 increase this year. The New York State Assembly has repeatedly passed bills to make MCI rent increases temporary but they’ve all died in the State Senate. MCIs are just one example of the loopholes in our rent laws that have incentivized landlords to terrorize tenants out of their homes. Governor Cuomo hasn’t just done nothing to help, he’s actively worked to keep Republicans hostile to rent regulation in power in the State Senate. In 2012, he signed a redistricting bill that could have been written by the real estate industry. The district lines in this bill effectively ensured a State Senate as beholden to real estate interests as he is. We need to think beyond just re-regulating the units we’ve lost. Millions of tenants across the state, in communities with no rent regulation at all, struggle to stay in their homes. Every tenant in New York State deserves the right to live free from eviction. Every tenant deserves protection from massive rent hikes and displacement. Housing justice is a matter of economic and racial justice. Communities of color all over the state are threatened with harassment and are being priced out of their homes. It doesn’t have to be this way. We can and we must guarantee every tenant in New York State basic protections and the right to live without the constant, grinding fear that they could be forced from their homes at any moment. To make this a reality, we are building a mass movement for housing justice like this state has never seen. I’m fighting for universal rent control for myself, my neighbors and the millions of tenants across New York City who struggle with the same harassment and pressure from their landlords. The Democratic Socialists of America are joining tenants across New York State to rally for housing justice for all on June 14th on the steps of the New York Public Library join us. This is reader-supported news. Make a contribution today! Michael Cavadias is a longtime New Yorker, rent-stabilized tenant and a member of NYC-DSA. Follow him Twitter at @michaelcavadias. 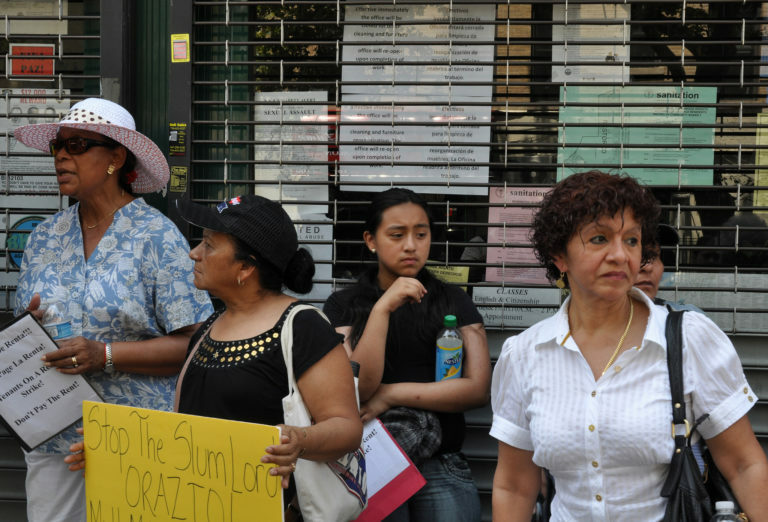 Photo: Rent striking tenants in Sunset Park, Brooklyn. Credit: Michael Fleshman.